Ecocentrism (meaning values centred on ecology) and technocentrism (meaning values centred on technology) are two opposing perspectives concerning attitudes towards human technology and its ability to affect, control and even protect the environment. Ecocentrics, including “deep green” ecologists, see themselves as being subject to nature, rather than in control of it. They lack faith in modern technology and the bureaucracy attached to it. Ecocentrics will argue that the natural world should be respected for its processes and products, and that low impact technology and self-reliance is more desirable than technological control of nature. Technocentrics, including imperialists, have absolute faith in technology and industry and firmly believe that humans have control over nature. Although technocentrics may accept that environmental problems do exist, they do not see them as problems to be solved by a reduction in industry. Rather, environmental problems are seen as problems to be solved using science. Indeed, technocentrics see that the way forward for developed and developing countries and the solutions to our environmental problems today lie in scientific and technological advancement. Today, most people still believe in the necessity of human progress. Conservationist principles, and the ability of technology to protect nature, should ensure that today’s standard of living is maintained in the future, but not at the expense of environmental degradation. Most people today are probably still “shallow” environmentalists. This position, however, is unacceptable to the more radical environmentalists or ecocentrics who share the views of the “deep green” ecologists. A shift towards a more nature-centred rather than human-centred society would ensure that unspoiled areas are preserved and degraded areas restored. 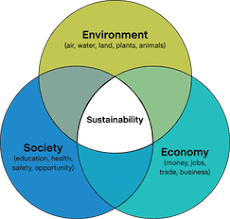 There is no denying that each of these viewpoints, in addition to the more traditional environmental perspectives, has its positive points, and it is these which must be considered when searching for solutions to environmental problems. The challenge facing society is to arrive at a consensus of opinions, through a global discussion about what is best not only for humans, but also what is best for the rest of nature as well.